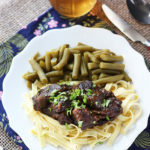 These savory stovetop beef tips and noodles are slowly simmered until fork tender in a rich gravy with onions, bell peppers, and mushrooms. Heat the oil in a large stock pot over medium heat. Add the stew meat and cook until browned, about 5-7 minutes. Remove meat from pan and set aside. Do not pour out the drippings. Add the onion, bell peppers and mushrooms to the pot and sauté until tender, 3-5 minutes. Add the broth the pot and scrape up any browned bits from the bottom of the pan. Add the peppers, butter, and brown gravy mix. Stir to combine. Cover and reduce the heat to low. Simmer for 1 ½ - 2 hours. Remove the pepperoncini peppers before serving and discard. Season with salt and pepper to taste. Serve over hot buttered egg noodles, rice or mashed potatoes. You can follow step one above and brown your meat. It will give your meat a nice color and add a little flavor. However, if you are short on time, it’s okay to skip this step. Spread the meat on the bottom of the crock of the slow cooker. Place the onions, bell pepper, mushrooms and garlic over top. Place the pepperoncini peppers and butter on top of the vegetables. Whisk together the beef broth and gravy mix. Pour over top.